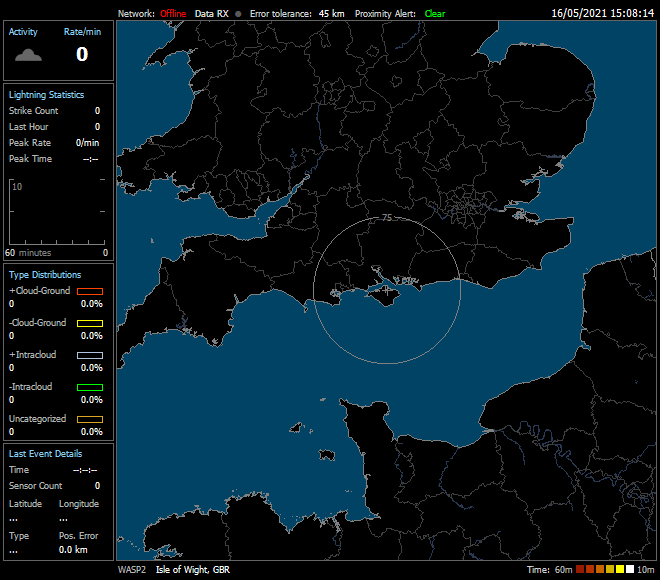 Here we present live storm data and sferics generated by data recorded by our weather station at Newport, Isle of Wight. This is recorded in real time using a Boltek Storm Tracker PCI lightning detector, and we are currently using Astrogenic Systems NexStorm 1.7.0.2612 Public, Astrogenic Systems StormVue NGX, Astrogenic Systems StormVue 1.54XE, and Astrogenic Systems TSentry 1.0 software applications. 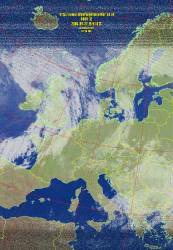 We are able to generate the following detailed plotting of storms around Western Europe, with the map centered on the Isle of Wight. Our data is shared with the StrikeStar EU Networked Lightning Locator System, and the Blitzortung Lightning Tracker System. The Boltek PCI StormTracker works by detecting the radio signals produced by lightning. These are the same signals you can hear on an AM radio during a thunderstorm. The Boltek PCI StormTracker's direction-finding antenna provides direction information while storm distance is calculated from received signal strength. Special processing in software reduces the effects of strike-to-strike energy variations providing more accurate distance information. Our station is one of the leading Storm Detection Systems in the UK, and the most used Thunderstorm Information Portal in the South of England, with our data comparing very well with all the official Storm Detection / StrikeStar EU Network / Blitzortung / UK StrikeStar Network / Sferics / Lightning Detectors / Boltek StormTrackers in the UK and Europe. Our data is uploaded every minute, with a screenshot as well as the StormVue Java applet. When tracking UK Thunderstorms, it seems that if there is a storm in close proximity to our detector, generating very strong signals, and there is a weaker storm further away, but on a similar bearing as the close one, the further storm may not be correctly identified. This seems to be a slight limitation to the system we use. Some detectors out there do seem to struggle to even get the direction correct, let alone the distance, but we do try to be as accurate as we possibly can be. Our equipment will soon be boosted by the addition of a Boltek EFM-100 Atmospheric Electric Field Monitor. More details to follow. 2013 was again, quite time, but lets hope our new Boltek Detector will bring more activity during 2014. For help using this new application, click here. Due to security warnings with the old Java StormVue 1.5XE, this has been moved here. At the beginning of August 2014 we upgraded to an even faster dedicated server, with a faster data connection to improve our free service. If you have fun when you are watching, please feel free to make a small donation to help us keep StormVue and TSentry running. The above image has an auto range facility, which will zoom in to the closest thunderstorm to the yellow cross situated in the middle of the map, which is the location of our system. The red circle has a 16 mile radius, which allows us to distinguish Close Lightning Strikes. Use the StormVue map to find types of lightning strikes occurring, then use the density plot to see where the thunderstorms are. For an auto refreshing image, click here. Click the above image to view tabular data generated from the archived data files collected by our Astrogenic NexStorm Software. These tables are created automatically using discharge V1.10 software written by Daniël van Os. 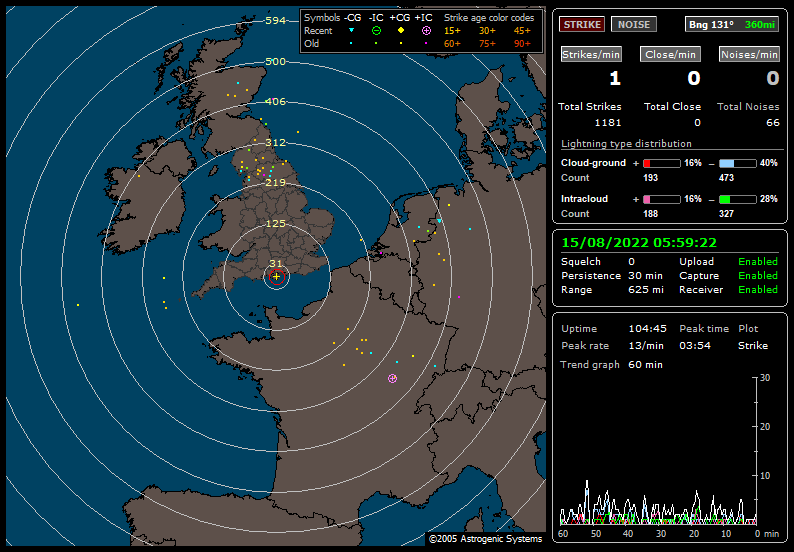 The Isle of Wight Weather Station is a member of the StrikeStar EU community based lightning detection network. Data is uploaded to a central server, and triangulated with data from other members of the community to increase the accuracy of plotted data. Click on the logo above to see that data. Although we strive to get accurate data, this lightning data is only approximate and should not be used for safety applications. Strike and storm locations indicated and alarm statuses are as accurate as possible, but may be erroneous and should not be used to safeguard personnel, equipment or data. Cloud-to-ground lightning is the most damaging and dangerous form of lightning. It is not the most common type, but it is the one that is best understood. Most cloud-to-ground lightning strikes come from the negatively charged bottom of the cloud traveling to the positively charged ground below. Some cloud-to-ground lightning strikes deliver positive charges to the ground. Positive strikes are less common and come from the higher regions of the thundercloud. In cloud lightning is the most common type of lightning. This occurs between oppositely charged centers within the same cloud. 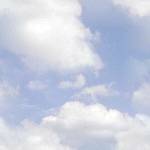 This means that there are both positive and negative charges within the same cloud. Usually the process takes place within the cloud and looks like a bright flash of light which flickers. This bright flash may leave the cloud and the flash can be visible for many miles. A less common lightning strike occurs between oppositely charged areas of different clouds. This means that there are positive and negative charges within different clouds and the strike travels in the air between them. This type of lightning is known as intercloud lightning. The Isle Of Wight Weather Station Network cannot be held responsible for the accuracy of this data. We will attempt to keep the data systems running, but occasionally they may go offline for maintenance. Copyright © isleofwightweather 2003-2015. All copyrights, trademarks, service marks, and logo's are the respective property of their holders. This site may not be copied without the written consent of isleofwightweather. All text that is intellectual property is copyrighted. Images and our logos are copyrighted and may not be reproduced in any way without the written consent of isleofwightweather. We sell spare parts for milking machines, dairy water heaters and portable milking machines. Specialist dairy engineers and milking machine installers here. dc engineering are the leading Isle of Wight PAT Testers. Also see iww.co.uk, iww.com, iww.info, iww.org, iww.eu, iww.cc and iww.net which are all part of the Isle of Wight Weather Station Network. This site is supported by calf-feeding, and is maintained by Shaun Wheeler. Last updated on 24/04/2019.